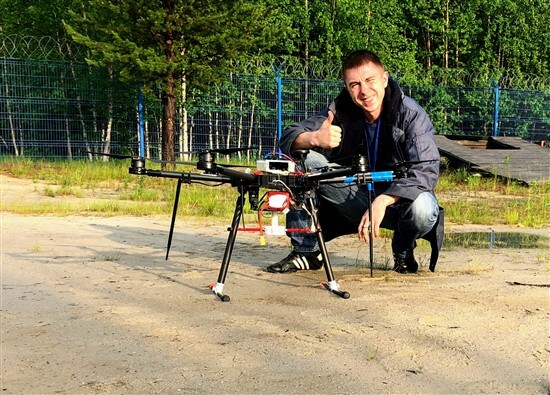 Skolkovo resident Cursir has successfully tested its innovative drone-using system that could drastically change how Instrument Landing Systems (ILS) that help aircraft land are tested for accuracy. Cursir's drone-mounted system with one of its developers, Anton Golovenko. Photo: Cursir. ILS is a radio-navigation system that provides aircraft with horizontal and vertical guidance just before and during landing. The system usually comprises three parts: a localizer transmitter (an antenna array that enables the aircraft to home in on the runway), a glide path transmitter (which provides vertical guidance and ensures the aircraft reaches the runway at the proper touchdown point) and marker beacons. These transmitters and beacons rely on radio signals, so it is crucial that the radio-navigation devices are working accurately. To this end, the devices are tested regularly by specially equipped laboratory aircraft to measure and calibrate the precision of the ILS. “These tests are obligatory all over the world and are regulated: in some places, they have to be performed every year, in others, every six months – it depends on the country’s requirements,” explains Vitaly Munirov, CEO of Cursir, a resident of the Skolkovo Foundation’s space and industrial technologies cluster. Cursir has created a complex of equipment and software that enables these ILS calibration tests to be carried out by a drone rather than an aeroplane. 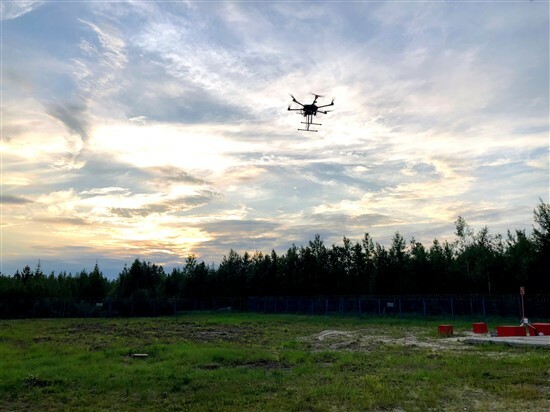 The startup tested its system on July 9-13 at the Noyabrsk airfield in the Yamalo-Nenets Autonomous Okrug in western Siberia, and proved that the results obtained by an emissions-free drone-borne system are as accurate as those from a laboratory plane. “The trials at Noyabrsk were essentially proof of concept,” Munirov told Sk.ru. Cursir's system being tested at the Noyabrsk airfield in the Yamalo-Nenets Autonomous Okrug. Photo: Cursir. Cursir’s complex means the checks can be carried out as frequently as required to ensure that everything in the ILS is working just as it should be, without incurring the costs that a laboratory plane would. “The staff servicing these systems on the ground will get prompt and complete information about the condition of the landing systems, which is an extremely important component in guaranteeing safety when an aeroplane is landing in zero visibility or heavy rain, when the plane is being landed on autopilot, or when there is very low-lying fog that only enables the pilots to see the runway at the very last minute,” explains Munirov. Maxim Rusakov, head of the use of electronic test equipment and communications service at the Noyabrsk centre (a branch of the State Corporation for the Organisation of Air Transport in Russia), who oversaw the testing of Cursir’s mobile testing system, said it made it possible to perform wide-ranging actions to confirm the accuracy of electronic test equipment. “An undeniable advantage of the complex is its mobility,” Rusakov was quoted as saying by Aviaport.ru. “It makes it possible to swiftly identify problem areas, not only before fight checks using a laboratory-plane, but also during transition periods. 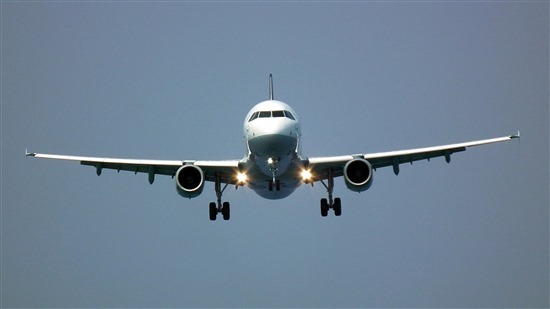 It also offers the possibility of promptly checking equipment in the event of complaints by flight crews,” he added. Members of the Cursir team together with engineers from the Noyabrsk centre after the successful tests. Photo: Cursir. Cursir’s chief competitors are projects in China and Switzerland that are working on the same basic idea, but the technology used differs, according to Munirov. “The fundamental difference between us is that the foreign projects are basically integrators: they use a drone and the electronic testing equipment complex used in laboratory planes, and that’s quite large for a drone – five to seven kilograms of metal – while we make our own complex of transmitting and receiving devices, and it weighs just one kilo,” he said. The company also develops its own software for the complex and for controlling the drone. Munirov and his team believe their solution could replace laboratory plane checks in the next five to 10 years, but like their international rivals, they would need a change in the legislation that governs ILS checks. The Swiss team, Skyguide, is currently carrying out monthly flight tests like the ones Cursir carried out at Noyabrsk, and plans to collect data during the next two years before attempting to get legislation changed governing the frequency of the equipment checks and how they can be carried out. Cursir has been a resident of the Skolkovo Foundation since December 2015, soon after the company was founded, and has made active use of the services available to resident tech startups, including microgrants and a minigrant that it used to develop the system that it has just tested, said Munirov. The company also actively cooperates with other startups in the Skolkovo ecosystem, using drones made by fellow Skolkovo resident Tsuru Robotics: both an earlier drone built specifically to Cursir’s requirements, and a modified Tsuru drone in the recent Noyabrsk tests. Planes coming in to land use ILS to provide them with horizontal and vertical guidance. Photo: Pixabay. In Russia alone, the market for the project is worth hundreds of millions of rubles, Goldt told Sk.ru, noting that Cursir’s system makes it possible to conduct checks both cheaply and reliably, guaranteeing the safe landing of aircraft, and saving operators both time and money. “The project has already caught the attention of foreign colleagues: at the Startup Village in June, an agreement was signed with a Finnish company that will represent Cursir’s interests in Finland. There are no similar products in the world that are this close to being ready yet, and even those planned can be counted on a person’s fingers,” he added. Cursir’s plans for the future are now focused around creating more modules to make its system compatible with more landing systems. “There are up to a dozen different kinds of systems in use around the world, and we are creating a complex that will work with all of them,” explained Munirov. During the five-day trials at Noyabrsk, the company tested its system with an ARP-75 automatic radio direction finder and SP-75 landing system. “We have completed the first two steps. Now we have five or six more steps to take: we are increasing the volume of equipment that we can service,” said Munirov.